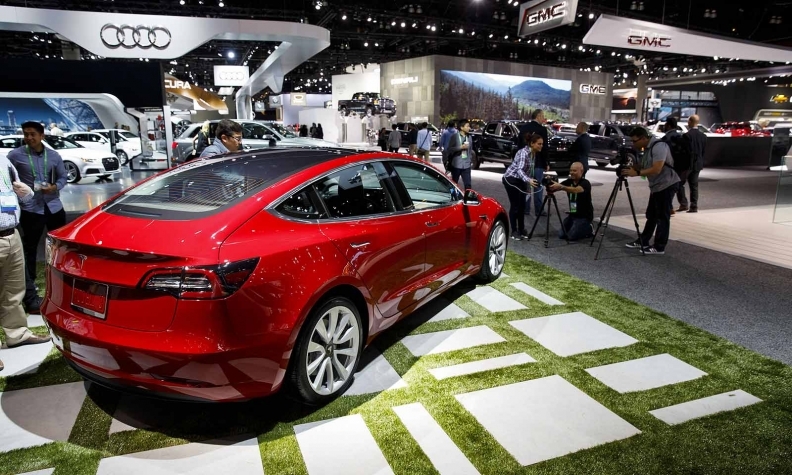 Tesla's Model 3 on display at the 2018 Los Angeles Auto Show. Consumer Reports magazine won't recommend Tesla's compact Model 3 because of the electric car's long stopping distances and difficult-to-use controls. In a review, the magazine, which once gave the larger Tesla Model S its highest rating ever, said the Model 3's 100 kph (60 mph) stopping distance of 46.3 meters (152 feet) was "far worse than any contemporary car we've tested." It took 7 feet more that Ford Motor's F-150 full-size pickup. The company told Consumer Reports that its own tests averaged a stopping distance of 133 feet and that results vary based on weather, tire temperature and other conditions. Consumer Reports praised the car's battery range, handling and "exhilarating acceleration" that could make it a strong competitor to performance-oriented luxury makes, such as BMW's 3 Series and the Audi A4.